It is a fact: tags slow down web pages. With the explosion of digital marketing vendors, the number of tags on pages has grown exponentially in the last few years. It is now common for organizations to use dozens of digital marketing tags on their site. This creates a challenge for IT teams that need to continuously deploy page tags while maintaining site performance thresholds. Tag management solves this problem. By deploying a number of methodologies, tag management improves site performance while allowing organizations to deploy digital marketing tags in an agile way. This white paper provides a description of such methodologies and their benefits. Tealium is the leading provider of tag management systems, allowing business users to manage their analytics and digital marketing tag deployments in a simple drag-and-drop interface. 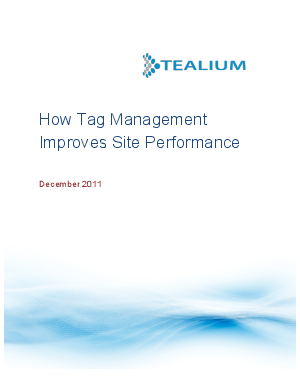 Tealium tag management is deployed in days, instead of weeks or months. Tealium helps organizations save on IT costs, streamline their deployments and improve site performance.